Overview: Autodesk Alias is an industrial design software utility that powers your creative process with a range of sketching, modeling, surfacing, and visualization tools. Create compelling designs with tools tailored for industrial design, automotive design, and technical surfacing. There is an array tool for modeling grills, speakers, and wheels, you can also lay down “stitch patterns” with the new Path Array tool, along with integrated sketching and illustration tools and product visualization produces high-res imagery for marketing product designs. The participant will learn specific workflow and work with more advanced Alias Studio surface models. Participants are encouraged to bring projects to work on in class. General principles of product design as related specifically to manufacturing. This is not a Class-A workshop. Prerequisite: Industrial design degree helpful but not necessary. This workshop has been designed for experienced Alias users. Consider our Level 1: Alias Design class if you want the skills to advance to this Level 4: Alias Studio Modeling for Tooling class. We also have an amazing 4 Week Comprehensive Alias Design class which is a must have for anyone serious about Industrial Design Software. Modeling techniques for the core tools with respect to tooling data. 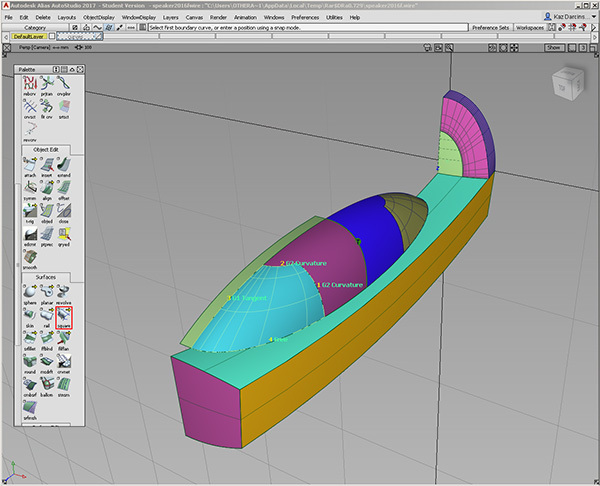 Master blend curves, align functions, and surface fillets. The forty-hour workshop can be tailored to work with individual or corporate projects. Draft techniques for production tooling. Discuss the difference between bezier and NURBS. Learn about CV distribution and span distribution. Discuss with examples global evaluation, diagnostic, and shading. Discuss with examples the import process for taking tooling data into engineering tools such as Solidworks or Creo.